Reading disability (RD), or dyslexia, is the most common learning disability with a prevalence rate of ~5%–10% in school-age children. RD is highly heritable with evidence of a neurobiological origin. Linkage studies have identified several quantitative trait loci (QTLs) for RD. The QTL on chromosome 6p21.3 has been independently replicated by several groups and spans a 16.4-Mb (13.8 cM) interval from D6S109 to D6S291. In this study, we performed sib-pair linkage analyses with Haseman–Elston and DeFries–Fulker methods to define more accurately the QTL interval. 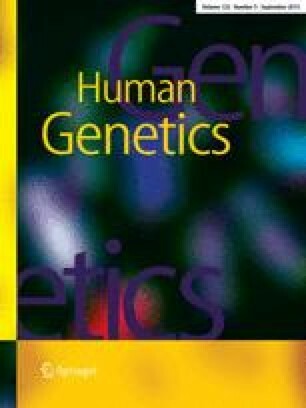 Linkage was assessed by using five quantitative phenotypes, including a composite measure of reading performance and four component phenotypes. When probands were selected for severe scores, single- and multi-point analyses showed significant linkage with all five phenotypes, converging over an interval of ~3.24 Mb spanning D6S1597 to D6S1571. Maximal linkage converged at marker D6S1554 across phenotypes. Out of 12 genes in the linkage interval, ten clustered within ~680 kb and were selected for association analysis based on central nervous system expression and putative function. Marker-trait associations were assessed by using QTDT (a general test of association for quantitative traits) and the family-based association test (FBAT), and haplotype analysis was performed by using FBAT and the GeneHunter Transmission/Disequilibrium Test TDT. Marker associations were detected in five of the ten genes, results that were corroborated by our haplotype TDT analysis. The results of the association study have thereby allowed us to significantly reduce the number of possible candidate genes and to prioritize genes for further mutation screening. We are grateful to all of the families who participated in this study, which was supported in part by National Institutes of Health (NIH) NICHD grant 5P50 HD27802–12 and NIH grant 5-R01 HD34812. Some of the results presented here were obtained by use of the program package S.A.G.E. from the Department of Epidemiology and Biostatistics, Case Western Reserve University, Cleveland, which is supported by US Public Health Service resource grant 1 P41 RR03655 from the National Center for Research Resources.